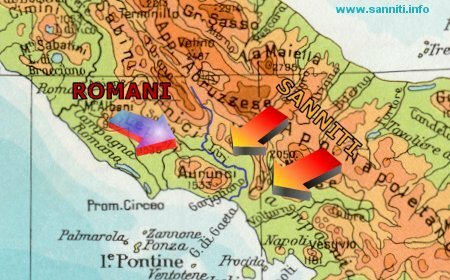 History of Samnium and Samnites - The first Samnite War. Not new but unexpected, around the end of the V century b.C., a demographic reality posed for the Samnites a great problem. Overall, the population's increase was leading to some dissatisfaction either for not having enough land to cultivate or lack of available pastures: in other words, there was not enough land to go around. Besides this very important factor, the social evolution was leading the Samnites to new form of incomes, like the expansion of marketplaces as well as the exploitation of mining fields for the production of arms and tools. This being the situation, the Samnites resorted to the annexation of neighbouring territories. It is not known how the Samnite League would divide the conquered lands among its tribes, but it was certain in the cases of territories' annexation. The League's intent was not to strike and raid, rather being in dire need of pasturelands, they would look forward to their fair control not to deceitful stealings. They were attracted in particular to the Apulia's lowlands, the valleys of the river Liri owned by the Vosci's and among all of them, the Campani's most fertile and rich territories. 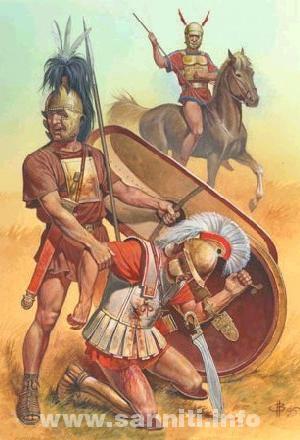 Without a doubt, their neighbors would attack them and retaliate, but ultimately the Samnites would win them over either because forced by necessity or, unlike their neighbors, for their armies' mighty strenght, well equipped and far better trained. They pushed east toward Apulia and controlled Luceria even tough not of Samnium' appurtenance but enjoying good relation with them. 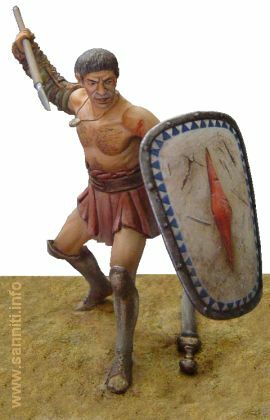 Samnite warrior - IV century b.C. On the west side towards Campania, they settled on both banks of the middle and high river of Volturno. Cities like Cubulteria, Trebula, Caiatia and Venafrum on the west side of the river remained under Samnites' control for the major part of the wars against Rome. In the northwest they were getting closer to the river Liri basin and the Volsci's living in there: hence, Atina and Casinum became Samnites' cities. Advancing towards the Liri's being so dangerously close to the Latium where the Romans had acquired total political control was not seen favourably by Rome. Much sooner than later a collision was inevitable. Outraged by the Gauls with your leader Brenno (remember "Vae Victis", 386 b.C., "Woe to the Losers"), Romans were only able to get away from that situation only thru sheer diplomacy and sums of money. After this incident, the Romans did understand the importance to control territories near Rome and the settlers therein. The continue scuffles with the Etruscans in the north, although kept in check, had created big headaches, while in the south many times the Volsci's were made to refrain from their expansionistic policies so much to become drastically weakened. The expansion of the two powers. The fertile lowlands of Liri and more to the south the Campania's, for the Romans as well the Samnites, became the most important of their objectives. The continued research to establish new colonies took the Samnites to cross over the river Volturno entering Campania's or the Liri's so that to settle extremely close to Rome. For both Samnites and Romans, the area around the river of Liri became of major importance and it was there that the great fight for the italian supremacy would take place. At stake were not only fundamental necessities not withstanding fertile lands and mining resources but a real freedom for one of those two nations. Fighting the Romans became inevitable even tough both camps valued each other's strenght and, being belligerant, was the wrong approach to the problem. After the first battles, surely, they realized to take diplomatic approaches since wars weakened their defenses against other people. Thus in 354 b.C. a peace treaty between the Samnite League and the Romans was enacted wherein each other's boundaries were stipulated. Obviously this represented an alliance between forces of even strenght and the very first treaty underwritten by the romans outside their own territory. Such a defensive treaty, diplomatically debated by both sides, established boundaries limited by the river Liri. No one was to cross it over or the treaty would become null and void with probability of an ensuing war. For more than ten years it was faithfully observed. Between these times both nations expanded toward the middle section of the river without crossing it. The Samnites were able to spread even toward the Campani's whose territory was not included in the treaty. The Romans not wanting to break up with the Samnites, soon enough became fearful of this expansion, so that this northern land of Campania turned out to be the new crux of the problem. This land was so fertile and densely populated that neither of the two powers could allow the other to control it. In the year 343 b.C.,the Samnites tried to take over the Sidicini of oscan idiom, inhabiting Teanum on the Samnium'western part. Fearful of an invasion these people asked the oscan Campani's for help, much large in population and being part of a league centering around the city of Capua. The Samnites did not like the Campani's intervention, advanced toward them conquering all the lands around the city. At this moment, according to Titus Livius, they asked the intervention of Rome, being reluctant to break up the treaty. In reality the territories in question on the southside of the river Liri were those being controlled by the Samnites according to the 354 b.C. treaty. The first engagements between the two peoples. Rome instead understood the importance of this territory falling into the hands of another military power. Several battles were fought. Among the romans' Magister Equitum and Consuls, joined in the war Marcus Valerius Corvus, Publio Decius Mure, Caius Marcius Rutilius and Aemilus Mamercimus. Roman historians do not mention any of the Meddix Tuticus taking part. Later on, both sides, realizing that peace could only be obtained diplomatically, ceased the hostilities reinstating the 354 b.C. treaty with a sanction stating the overseeing of northern Campania by the romans and the Sidicini's by the Samnites. This treaty established a lenghty peace among Rome and Samnium. However, the latter's power diminished due to the roman influence over a territory large enough to become a serious rival, bringing to Rome enough manpower and wealth resulting hence in a demographic, military and economic increase. Rome's expansionary target would now point out to the south thus initiating the latin colonies system, to say urban centers under roman control and installation either in the Frusinates' region or the western Campania extremely close to the Samnites. The pages that tell about continuation of the Samnite wars were suspended for the time being. The cause of this is the inaccurate translation of some technical terms. Please refer to pages in Italian, translated with one of the many translators on the Web. Excuse us for this inconvenience.